Fancy a hot soak after your spin around Marin? 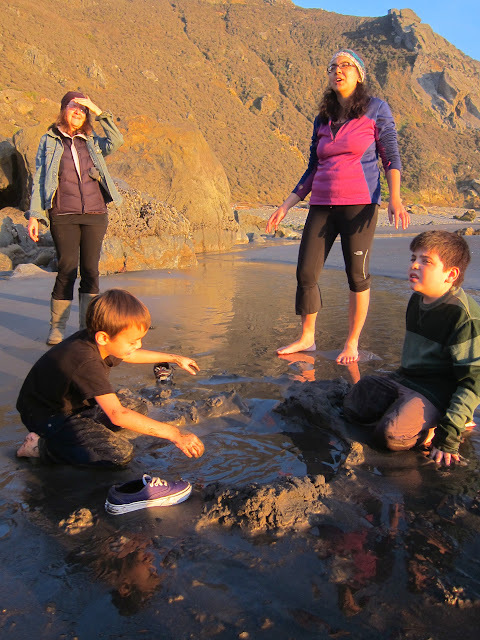 Try the hidden hot springs at this wave-washed cove, located just north of San Francisco along coast Hwy 1. 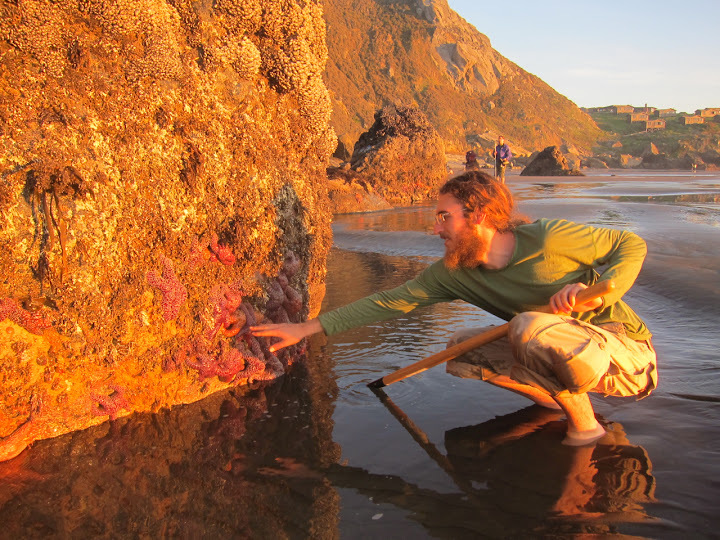 During minus tides, a rocky pool at Steep Ravine fills with a salty, sulfury elixir … and long haired locals getting their hot spring fix. Most locals park their pickups above the bluffs and make the treacherous hike down to the hot spring grotto. For bike camping, reserve a spot at Steep Ravine Campground and skip the hike. A quick paved descent takes you into the campground from coast Hwy 1. After ditching your camp gear at one of the cabins or tent sites, the hot springs are just a 10-15 minute walk from camp. Since you’re headed there at low tide, be sure to explore the intertidal denizens temporarily stranded along the beach. Joe inspects an armada of starfish stranded by low tide. In the upper right are the cabins at Steep Ravine. Route: These hot springs are within a day’s ride from the Bay Area along my favorite local stretch of coast Hwy 1. Click to find my round trip route here. After crossing the Golden Gate Bridge, the route follows a well-marked bike lane to Mill Valley. This quaint town is built for brunch. I like taking my Sunday second breakfast at the Depot Cafe. You can’t miss the restored train depot which houses this bookstore cafe combo on the town green. From Mill Valley, the route climbs through a redwood glade and then descends from Panoramic Blvd, passing the crowded Muir Woods parking lot. My favorite part begins after a short, tough climb. Here, coast Hwy 1 follows a contour high above the crashing waves — WHOOP! — for 10 miles of swooping in and out of ravines and headlands. Stinson Beach soon comes into view. Just before Hwy 1 begins descending, you can’t miss the gated entrance to Steep Ravine on your left. Season: Weather in Marin and Pt. Reyes is mild year round. Any sunny weekend is a good time to ride. However, check the wind direction as you can get devastating headwinds out of the north in any season. During late-spring through summer, heavy fog can obscure the beach views and make for a cold clammy ride — bring clothing layers in any weather! Camping: Steep Ravine Campground overlooks a wave-washed cove located just north of San Francisco along coast Hwy 1. The stunning sunsets and sweeping ocean views make this a very popular campsite — the cabins are always booked out 7 months in advance! Tent sites also go fast during peak season, but in the winter, these can be available just a few weeks in advance. Make your reservations here. Soon after taking this picture, the kids jumped into the mini hot tub they dug on the beach shoes, shirt and all. Hot Springs: The geothermal vents are found on the beach and at the base of the cliffs. These are only exposed at low tides of -1ft or more. Check your tide tables here. To find the springs, look for steam and follow your nose to the smell of rotten eggs. You can bring a shovel to dig your own hot pot on the beach, but most folks head to the hot springs grotto. The grotto is maintained by a cadre of locals. One will usually arrive early with a length of firefighting hose to siphon out the chilly ocean water. The spring then replenishes warmer water. To find the grotto, follow the faint trail at the base of the cliffs several hundred meters north. You’ll know you’re there by the long haired hippies. Whether you’re going in clothing optional (which almost everybody does) or not, be sure to leave your dry things high on the rocks, out of reach of the waves. Steep Ravine is a small, wild hot springs. It is not a resort. Please be respectful during your visit, introduce yourself to the folks who maintain it, and consider bringing only a friend or two. Please see the comments section below and join the conversation about how to keep the hot springs a friendly place for future visitors. Please consider removing this post re the SR hot springs. The springs are currently being overwhelmed by legions of social media newbies, who harvested posts like yours & show up with not one but several friends. Thank you for your consideration. Thank you for sharing your concern with me. Steep Ravine is such a treat, and I hope to work with you and others to keep it a wonderful, relaxing, community driven place. My blog is an open journal of my bicycle travels. It is also, hopefully, an inspiration to seek out and experience — via the bicycle, my favorite vehicle for low-impact and adventurous travel — the wild and wooly places we have so close by here in the Bay Area. I hope to generate positive experiences for both adventure seekers and the communities that they encounter in their travels. I recognize that the spot is maintained by volunteers from the local community, rather than an organization like the National Park Service, and that it is not a commercial enterprise that might benefit from increased traffic. However, Steep Ravine has also been written up in far more widely read forums than my blog, including Weekend Sherpa, Yelp, and the SF Bay Guardian, as well as hot spring travel books. I feel that the best that I can do as a blogger for Steep Ravine is to help set a community standard of behavior for those who choose to seek it out. If you’d like, send me what you think might be good guidelines for “newbies.” For example, consider that Steep Ravine is a small, wild hot spring and not a resort. Bring a friend, not a tour bus. I would be happy to add this as an addendum to my post. I look forward to your response. Thank Andri for the kind words! thanks for writing this up, Ginger!